Shipped at 4°C. Store at +4°C short term (1-2 weeks). Upon delivery aliquot. Store at -20°C. Avoid freeze / thaw cycle. Store In the Dark. Our Abpromise guarantee covers the use of ab150169 in the following tested applications. ICC/IF image of ab89984 stained HeLa cells. The cells were 4% formaldehyde fixed (10 min), permeabilized with 0.1% Triton X-100 for 5 minutes and then incubated in 1%BSA / 10% normal donkey serum / 0.3M glycine in 0.1% PBS-Tween for 1h to block non-specific protein-protein interactions. The cells were then incubated with the primary antibody (ab89984, 5µg/ml) overnight at +4°C. 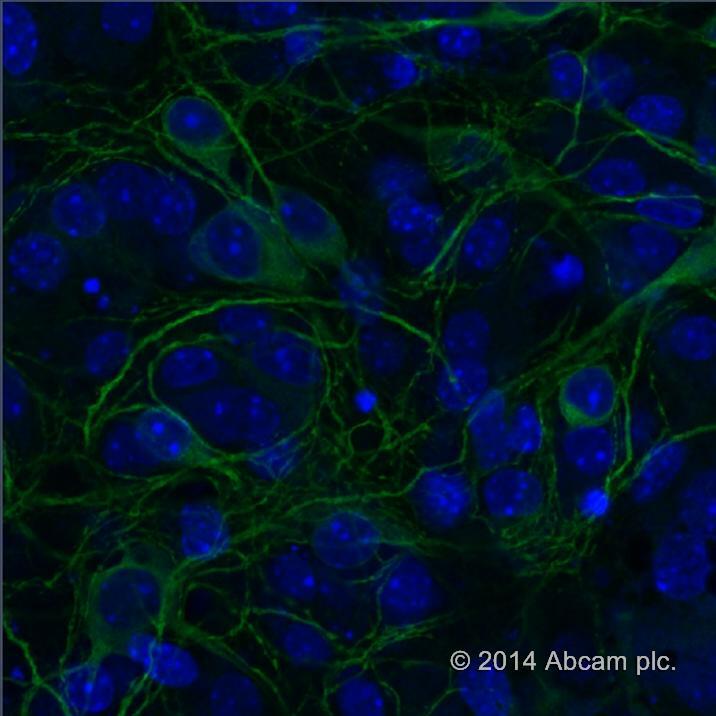 The secondary antibody (green) was ab150169 Alexa Fluor® 488 goat anti-chicken IgY (H+L) used at 1µg/ml for 1h. DAPI was used to stain the cell nuclei (blue) at a concentration of 1.43µM. Publishing research using ab150169? Please let us know so that we can cite the reference in this datasheet. I am looking for a secondary antibody for Anti-GFP antibody (ab13970) (made in chicken). Would this be an appropriate secondary antibody? I am happy to confirm that ab150169 (Goat Anti-Chicken IgY H&L (Alexa Fluor® 488)) is a suitable secondary antibody for ab13970 (Anti-GFP antibody (ab13970)). I would like to note that chicken IgY and chicken IgG are the same kind of immunoglobulin. Chicken IgY is the major circulating antibody found in chickens and is the avian counterpart to mammalian IgG’s. IgYs are equivalent to IgGs in most applications, including Western Blotting, ELISAs, immunohistochemistry, immunocytochemistry. Unlike the gamma-chains of IgG, however, the heavy chains of IgYs lack Fc domains, which means that IgYs do not fix complement nor bind protein A or protein G.
Chickens also produce an alternatively-spliced form of the heavy chain in which the Cnu3 and Cnu4 domains are deleted. In some individual animals, this F(ab)2-like heavy chain can be seen running at 40 kDa in SDS-(10%) polyacrylamide gels.